A rare break in the weather today; it is above freezing and making a mess out of the farmyard. It's raining and I thank God it is not snow but instead melting snow cover. Laughing to myself, and thinking, Wow, we now have more room to put snow, still with four months ahead of potential winter storms. Taking refuge from the rain and settling in on a bale of straw in the big old red barn, I am thinking to myself that today I am not in a hurry to finish up chores. The animals are taken care of, no hauling water today. Yippee! the rain has done that task for me. With some free time to myself, and nestled comfortably on my bale of straw, I am struck with how beautiful my humble barn appears to me today. I feel like I am in one of the most beautiful cathedrals of the world. With no money this year to replace missing windows, and being creative with what is at hand, the windows were covered in old feed sacks. All those hours watching HGTV pays off. In my mind today, I am in the world's most remarkable cathedral. My barn is a tranquil island, surrounded by a chorus of animals, bathed in a spectrum of light that is radiating from sack-covered windows. I am mesmerized and comforted by the warm glow of a kaleidoscope of colors, sounds, smells. This is my homestead. How lucky am I. You are very lucky indeed. To own a working farm is a joy and something to be very proud of. Enjoy Life. The country is where life begins for a lot of folks who don't realize and appreciate where their food comes from. Join in and write your own page! It's easy to do. How? 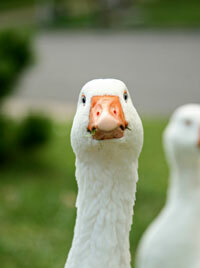 Simply click here to return to The Adventures of Goose Poop Farm.